The deep sea dwelling blue Lord has been known as the protector of the realms. Legend has it that whenever the earth needs to rid itself of the evil, Lord Vishnu is born in a particular form to eradicate the evil. Whether it be the Maryada Purusha Sri Rama or the perfect personality Sri Krishna, there have been forms in every Yuga. We know about the various forms but how does the one-third of the Holy Trinity look like? What are his features that aren’t mixed with his forms? Here is a look at the iconography of Lord Vishnu. The name Vishnu is taken from the word “Vish” which means to spread in all directions and therefore he comprises the entire Universe which is ever expanding. The word Vishnu means ‘one who pervades, one who has entered into everything’. As a god who has the responsibility of maintenance, Vishnu requires lots of wealth; his consort, therefore, is Lakshmi – the goddess of wealth. 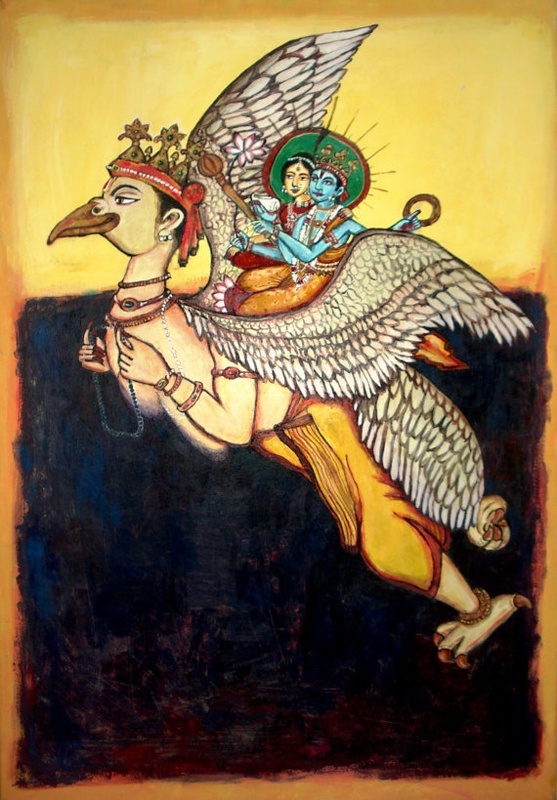 The vehicle of Vishnu is a bird (eagle or hawk) or a half man half bird named Garuda, whose name means “Wings of Speech”, a figure of great strength, power, and piousness. The first adhyaya of Agni Purana begins with saying that Lord Vishnu is the foremost of male being. But Vishnu took the form of a female – Mohini to trick the asuras and make sure the gods get a share of the Amrita during Samudra Manthan. As Mohini, Vishnu has a son with Shiva who is known as Harihara (also known as Ayyappa). A concise picture of the Vishnu-image is presented in Gopala-uttara-tapini-upanishad (45-48): His feet bear the auspicious signs of a celestial standard, a royal parasol. His chest is adorned with srivatsa locks of hair, the brilliantly shining kaustubha gem and rows of forest-flower garlands (vanamala). His four hands hold shankha (conch), chakra (discus), Gada (mace) and Padma (lotus).He is adorned with armlets, garlands, jewels, diadem, and earrings shaped like Makara the sea monster (makara-kundala). Vishnu is the middle one of the Hindu Trinity –Brahma, Vishnu, and Shiva. Each of the Trinity is associated with one of the three states of consciousness and three states of relative conditions (gunas- sattva, rajas, and tamas). He is to be depicted as a four-armed male-form: The four arms indicate his all-powerful and all-pervasive nature. The physical existence of Vishnu is represented by the two arms in the front while the two arms at the back represent his presence in the spiritual world. The Upanishad titled Gopal Uttartapani describes the four arms of Vishnu. Four arms represent the fulfillment of manifestations in all spheres of life. They symbolize domain over four directions of space and thus the absolute power over all universe. In the case of Vishnu, the four arms are also said to represent three fundamental functions or tendencies [creative tendency (shristi), the cohesive tendency (sthithi); and, dispersion and liberation(laya)] and fourth being the notion of individual-existence (ahamkara) from which all individualized forms arise. His four hands hold Shankha (conch), Chakra (discus), Gada (mace) and Padma (lotus). According to yoga theory, the throat is the seat of Vishuddha chakra – the center of extreme purity – which symbolizes pure consciousness, and creativity. It is the center associated with the faculty of higher discrimination, and with the formless space. The throat is also the center where pashyanti vak the formless speech manifests as audible sound (sabda). The garlands around the throat of Vishnu symbolize the display of manifestation (of duality) surrounding the formless nirguna. Vanamala is Vishnu-maya, the power of illusion of one who pervades all existence. He is adorned with golden-hue–silk garments (pitambara); he is richly and tastefully ornamented; and he is the very embodiment of all the grace, beauty and joy of the universe. The color of his skin has to be new-cloud-like-blue: The blue color indicates his all-pervasive nature, blue being the color of the infinite sky as well as the infinite ocean on which he resides and the infinite, formless, pervasive substance of the spatial universe, symbolizing his nature of limitless brilliance that pervades all universes. He has the mark of sage Bhrigu’s feet on his chest. Also on his chest is the Srivatsa mark, symbolizing his consort Lakshmi. It is, in fact, a lock of hair situated on his right chest, curling towards the right. Its color resembles that of the jasmine; (shukla varna dakshinavarta romavali) .Vishnu is thus Srivatsankita, the one who bears the sign of Srivatsa. It is said to symbolize Vishnu’s yogic powers (yoga shakti). It also represents the source of the natural world, the basic nature (pradhana). In the earlier depictions of the Vishnu image, Srivatsa was indicated as a small sized triangle (in the form of three leaves) on his right chest. In the images of the later periods, Srivatsa is in the form of small-sized Lakshmi (Vyuha – Lakshmi) with two arms. Some say it is meant to suggest that in this form, the jagrat state, Lakshmi the energy, is differentiated from Vishnu (the Purusha). A crown should adorn his head: The crown symbolizes his supreme authority. He is to shown wearing two earrings: The earrings represent inherent opposites in creation – knowledge, and ignorance; happiness and unhappiness; pleasure and pain. He rests on Ananta: the immortal and infinite snake.His feet bear the auspicious signs of a celestial standard, a royal parasol. The most common representations of Vishnu are as standing (sthanaka) in sama-bhanga on a lotus-pedestal (padma), or as seated (asana) relaxed and comfortable. He is also represented as Yoga-Narayana seated in yogic posture on a pedestal of white lotus. The other most common depiction of Vishnu is as reclining (shayana) on the coils of Sesha the serpent with multiple heads. Ayudha generally translates to weapons; but, in shilpa-sastra, the term indicates whatever objects the idol holds in his or her hands. Shri Vishnu in each of his four hands holds an Ayudha, an attribute: Shankha (conch), chakra (discus), Gada (mace) and Padma (lotus). The Shankha, conch, is the symbol of the origin of existence. It is associated with water the first element, the source of all life. It has the form of multiple spirals evolving from a point to ever-increasing spheres. When blown, it produces a sound associated with the primal sound from which creation expanded. Shankha represents the creative (shristi) aspect of Vishnu. The Shankha that Vishnu holds is named pancha-janya, born of five; and it represents the pure-notion of individual existence (sattvika ahamkara) from which evolved the principles of five elements (bhutas). The discus Sudarshana-chakra, beauteous to behold has six spokes equivalent to six petals of a lotus. Its nature is to revolve. It represents the universal mind, the will to multiply. (Vishnu purana 1-22-68). Chakra represents the cohesive (sthithi) aspect of Vishnu. The chakra is in the design of a wheel. The wheel is symbolic of life, ever –renewing itself in a cycle of time. The wheel of radiance symbolizes the Sun. Its six spokes represent the six seasons, the six cycles of the year. The nave, in which the spokes are set, the centre, represents changeless and motionless reality .The spin of the wheel creates the illusion of duality, the Maya. The gada, mace, named Kaumudiki is that which dazzles and intoxicates the mind. It is called the stupefier of the mind (Vishnu purana 1.22.69).The mace in Vishnu’s hands is the symbol of primal knowledge (adya-vidya). The mace Kaumudiki is often referred to as the female, the dazzler who destroys all that opposes it. Kaumudiki is compared to Kali the power of time. Nothing can conquer the time. (Krshna Upanishad -23). The Lotus, the immaculate flower rising from the depths of water, ever remote from the shore and unfolding in all its glory represents the evolving universe, the expansion of creation. It evolves from the formless endlessness of casual waters. The lotus is the symbol of purity, spiritual wealth, abundance, growth and fertility. It is sometimes taken as the emblem of six transcendental powers (bhaga: jnana, shakthi, bala, aishvarya, virya and tejas) which characterizes divinity (bhaga_van). The Vishnu image is at times endowed with a bow and a set of arrows. His bow is Saranga, and hence he is Saranga-pani the one who holds the sarangi. The bow targets the distant and the unknown. The sharp and blazing sword Nandaka (source of joy) represents sharp incisive intellect whose substance is wisdom (vidya) (Vishnu Purana 1.22-74). The flaming sword is the powerful weapon which destroys ignorance.The sheath which holds –hides the sword of knowledge is avidya. It represents darkness which is also an attribute of the divinity. The sword shines forth when it is drawn out of the sheath. 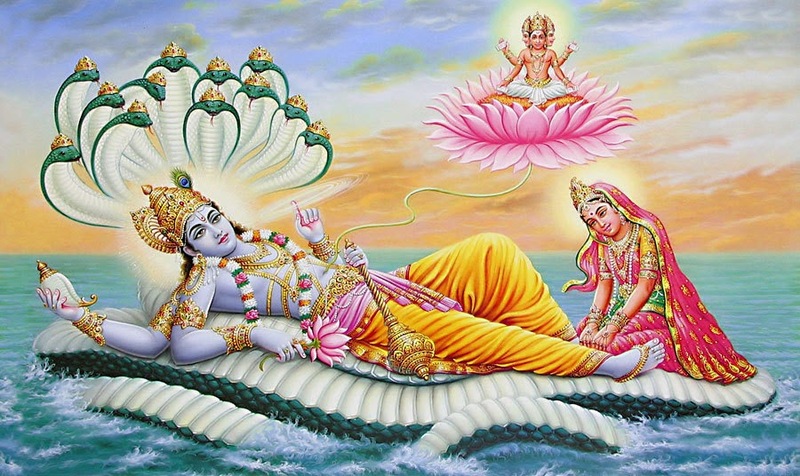 On the chest of Vishnu shines a brilliant gem Kaustubha, the treasure of the ocean. The Jewel represents consciousness, which manifests itself in all that shines: the sun, the moon, the fire and the speech. Garuda, the golden eagle is represented as a half human and a half bird of immense size and strength, equal in splendor to Agni.Vishnu rides Garuda in his jagrat (wakeful) state after the creative process is set in motion.Garuda means wings of speech, ‘whose wings transport from one word to another with the speed of light’. Garuda as three Vedas carries Vishnu the Yajna-pathi, with Rig (rhythm); Sama (sound); and Yajur (substance) all of which are elements of speech as also the ritual.Garuda the son of Kashyapa (vision) is hailed as the personification of courage. ‘The triad beautiful of the wing is courage itself, made into a bird ‘(shatapatha Brahmana: 6.7.2.6). Sesha, the primordial serpent, whose other name is Anantha, represents the non-evolved form of nature (prakrti).Vishnu sleeps in voga-nidra on Sesha floating on water, until he wills the next cycle of creation. Anantha (the endlessness) is also the name of Vishnu. Some scholars say that Sesha (reminder) or Anantha is Vishnu himself in his potent state, as the universe that hibernates before the onset of the next cycle of evolution. A slightly less seen depiction of Vishnu is the Vishwaroop representation. The Vishwaroop originates from the words Vishwa which means the cosmos and Roop which means form or manifestation. This grand depiction is the representation of his essence being magnified to contain the entire cosmos. The root for this depiction is probably derived from the ancient Hindu philosophy which indicates that through the diversities of creation there always is a connecting essence that threads everything into a unified whole. The Vishwaroop depiction shows Vishnu as having seven heads on each of his left and right. Each of these has its own cosmic function or represents an aspect of the cosmos. The gods depicted include Shiva, Brahma, Ganesha, Hanuman, Indra, Agni (Fire God), Surya (Sun God), Chandra (Moon God), Maruta (Wind God), Kubera (God of wealth), Varuna (God of water) and Yama (Time) and Brahma’s three sons. Vishnu retains the central position. While Shiva, Brahma, and Vishnu together form the Hindu Trinity, Ganesha and Hanuman represent faith and divinity. Agni or Fire represents life, energy, and vitality. Maruta, the wind-god represents space, while Indra represents rains and cosmic balance. Yama depicts the infinite nature of time while Varuna the ocean God represents water. 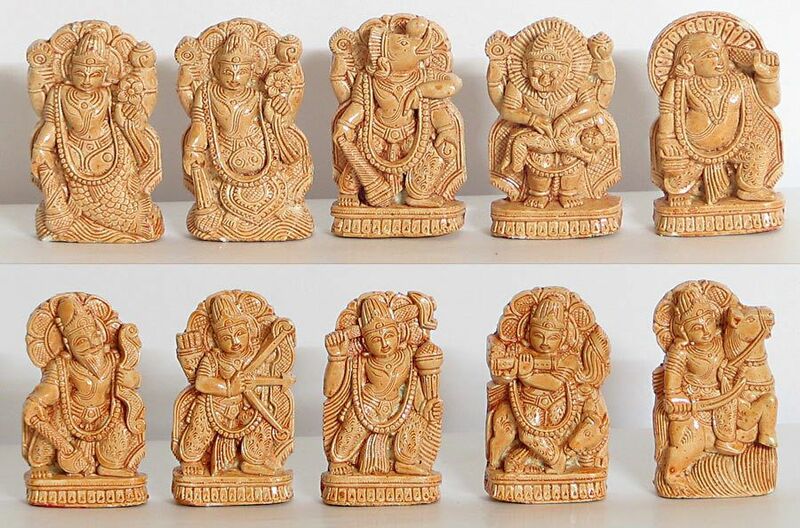 Kubera represents prosperity and riches. The Sun and Moon represent the cycle of birth, death, decay and finally dissolution. Brahma’s three sons represent the entire mankind. Taken together as one entity they constitute the entire cosmos. The image of a deity in the Indian tradition is a Bimba the reflection or Prathima the personification of the virtues, the glory and the attributes that one associates with the deity. It is explained that the Bimba like the reflection of the distant moon in a tranquil pool is the virtual image of one’s concept/ mental image of one’s deity, but it is not the god/deity itself. It is a suggestion or a pretext (nimitta) for the deity. The worshipper is aware that the forms (murti), sounds (mantras) and diagrams (mandalas) employed in worship are human approximations and are inadequate representations of God (prathima svalpa buddhinaam). Yet, he finds through them an approach to the Supreme.